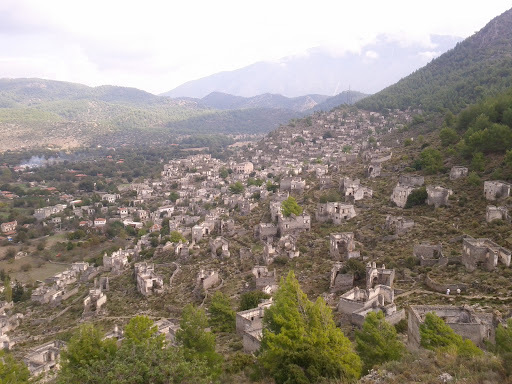 It felt a little eerie walking through this abandoned "rock village," about 8 km outside Fethiye. Just hundreds of empty houses, a couple of churches and an old fortress remain of this former Greek settlement. In 1923, Kayaköy was abandoned because of the population exchange between Greece and Turkey. Now, a few of the outer houses look like they have been reclaimed by local residents. There's also several small cafes, restaurants and a few pansyions to relax at or even stay at after you've explored the village. We spent more than 2 hours here today, so I will have lots more photos to post soon. Well worth the drive out of the city to explore. 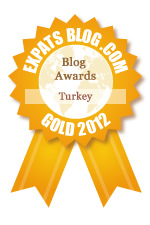 Liked your writing about Kayakoy. We visited last fall, unfortunately in pouring rain! About 470 houses south of the tarmac road and maybe 20 north of the road. Some houses were destroyed when the road was made, so let's say approximatly 500 houses at the time of the exchange, giving an estimated population of between 2,000 and 2,500. Tour guides who suggest much larger numbers are repeating nonsence from waiters and erronious web-sites. Thanks Joy, good post. Bloggers, Julia and Barry, are lucky enough to live close by to the site. @Dwight Long, thanks for your comments and for providing more information. I'm sorry I missed your comment before, but thank you for stopping by!